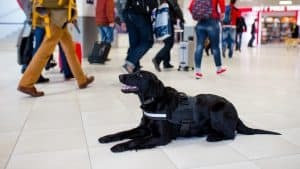 An “Emotional Support” Animal Mauls a Little Girl at an Airport | Larson Law Firm P.C. In December 2017, a young girl was attacked by an emotional support animal (ESA) at the Portland International Airport. The family of the young girl has filed a $1.1 million lawsuit against the pit bull dog’s owner, the airport, and Alaska Airlines accusing them of negligence in allowing the dog to walk through the airport without being in a crate, according to a story in the Washington Post. The Post story mentions that this emotional support animal’s attack of a little girl in the Portland airport is just another example of “bad support-animal behavior” at airports throughout the country. The issue is fueling debate about the regulation of emotional support animals in public transportation. According to the Post story, the family hoped to encourage airports and airlines to strictly enforce support animal policies, and to clamp down on fraudulent emotional support animals (which are often just people’s house pets disguised as helpers) while also making sure that legitimate emotional support animals are kept away from other passengers. According to the U.S. Department of Justice Civil Rights Division, Disability Rights Section, service animals help people with disabilities fully participate in everyday life. The Americans with Disabilities Act (ADA) is a federal law which requires state and local government agencies, businesses and non-profits to make “reasonable modifications” to their policies, practices and procedures when necessary to accommodate people with disabilities. These modifications include accommodating service animals. An establishment that would normally not allow pets must therefore modify their policy to allow service animals. Note that the ADA does not require that service animals be certified. According to the DOJ, “There are individuals and organizations that sell service animal certification or registration documents online. These documents do not convey any rights under the ADA and the Department of Justice does not recognize them as proof that the dog is a service animal.” The ADA does require, however, that service animals be trained to perform assistive tasks. This includes psychiatric service dogs, who are trained to help people deal with their mental illness. A psychiatric service dog could be trained to remind its owner that he or she needs to take medication at a specific time, for example. In short, a service dog has a job to do to help its owner move through the world. These animals are protected by the ADA and permitted in places pets are not. ESAs are allowed to fly, and can qualify for no-pet housing. These are the only two protections afford to emotional support animals and their owners. The North Dakota Century Code defines a service animal as “any guide dog, signal dog, or other animal trained to do work, perform tasks, or provide assistance for the benefit of an individual with a disability. The term includes an animal trained to provide assistance or protection services to an individual with a disability, pull a wheelchair, lend balance support, retrieve dropped objects, or provide assistance in a medical crisis.” Please note that emotional support animals are not listed as protected under the laws. Furthermore, under the law, you may be subject to a fine if you provide fake documentation for an emotional support animal; that fine cannot exceed $1,000. If you are caught using fake ESA documentation during air travel you can be kicked off the plane. Who is liable for the child’s injuries? A person with a disability may keep or possess a pit bull service dog or a pit bull assistance or support dog to the extent mandated by the ADA, Fair Housing Act or other federal or state law. A person entitled to keep or possess a pit bull service dog or a pit bull assistance or support dog under this exception may do so only if the person complies at all times” with the licensing regulations, as well as regulations for where the dog must stay, and how the dog must be leashed when in public. If the pit bull is a true, licensed ESA, then the law should protect it. If not, the city may force the owner to surrender the dog, plus levy fines in addition to those for fraudulent licensing. 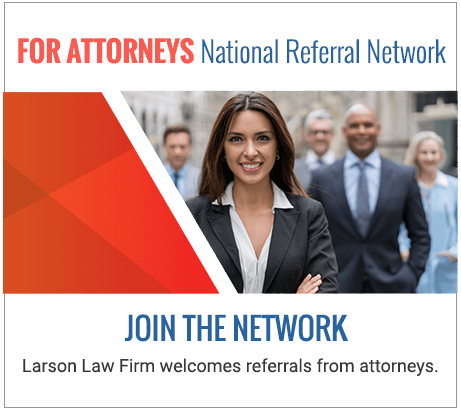 If you, your child or someone you care about was injured because of a dog attack or any incident due to the carelessness and negligence of another, the North Dakota injury lawyers at the Larson Law Firm P.C. are here to represent you. We dedicate ourselves to holding the liable party responsible and securing your family the compensation you’re owed. Call us today at 701-484-HURT or complete our contact form to schedule a consultation at our offices in Bismarck and in Minot.